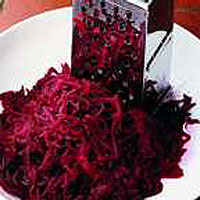 Drain a 200g pack organic cooked beetroot and pat dry on kitchen paper. Cut into small dice and place in a bowl with 1 finely chopped medium red onion, 2 deseeded and finely chopped green chillies, 1 pack fresh coriander, finely chopped, the juice of half a lime and salt and freshly ground black pepper to taste. Serve with grilled meat, chicken or fish. This recipe was first published in September 1998.